Origami Eiffel Tower – Takes Me Back to Paris! I was inspired to fold this origami Eiffel Tower model after a trip to Paris last year. I’ve had a bit of a fascination with the Eiffel Tower for as long as I can remember, even though I had never visited it until quite recently. I remember when I was young and I first saw a picture of it I was a bit puzzled why they had built it in the first place – it didn’t seem very useful. I was much too young to understand about things like revolution, liberty or national pride and I couldn’t see how there was space for any rooms in it. I thought it was very pretty but not very practical. There is actually a little room in the Eiffel Tower. Gustave Eiffel built a small office in at the top. 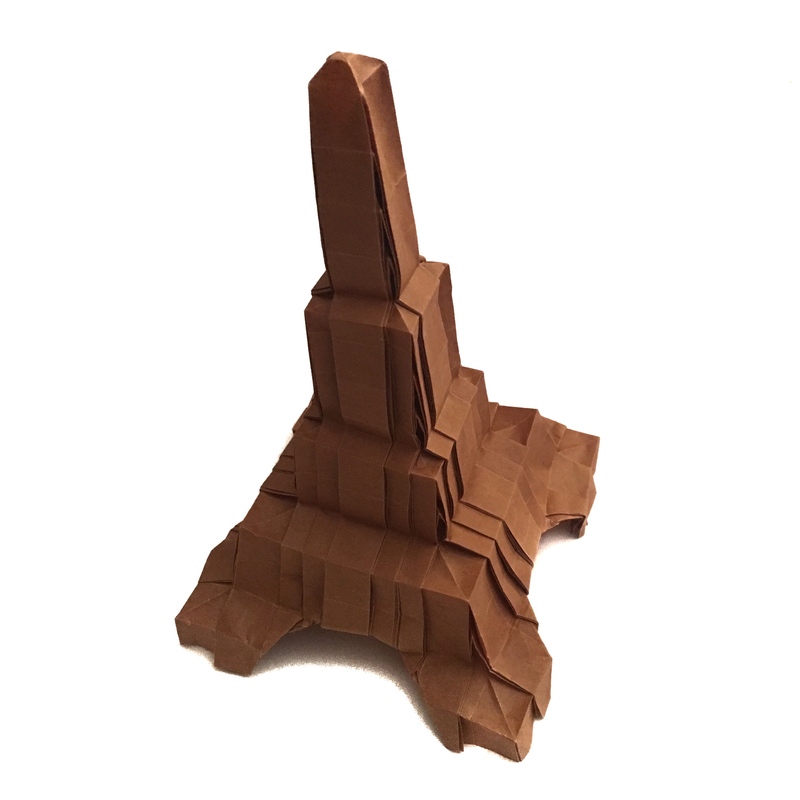 Now you can make your very own origami Eiffel Tower and save yourself the air fare to Paris! The view from the top of this one probably isn’t as impressive in this Eiffel Tower DIY model though, and it doesn’t have a lift. This model was designed by a British designer, Robin Glynn. I’d class this as an intermediate level design because it relies on accurate folding, although the steps themselves are actually very simple. It’s basically a 31 x 31 grid folded into a waterbomb base and pleated. It takes about two hours to fold. You need a reasonably large piece of paper for this model, otherwise the pleats will be too thin to form accurately. I recommend at least 35cm x 35cm (13.7in x 13.7in). Choose a paper that is quite thin and holds a crease well. If the paper is too thick it will be difficult to form the pleats, the corners will spring apart and the levels that form the structure of the model will not form correctly. I folded the Eiffel Tower in the pictures on this page from a 60cm x 60cm (23.6in x 23.6in) sheet of tissue foil from origami-shop.com. This produced a final model that is 25cm (10in) tall. The British Origami Society published diagrams for this cute Eiffel Tower model in issue 201 of their magazine. Alternatively, if you prefer video tutorials, Jo Nakashima has an excellent instruction video on his YouTube channel. Please note that this tutorial is 23 minutes long, but don’t take this as an indication of how long it takes to fold the Eiffel Tower! The video begins with’start with a 32 x 32 grid’, and Nakashima speeds the video up each time the instructions say ‘repeat on the other three corners’. Be prepared to press pause. A lot. Thanks for the comment Peter. I agree it’s a good model for practising pleating accuracy. I’m impressed you managed to make it out of printer paper and get a good result!